This article is about the number. For the year 38 CE, see AD 38. For other uses of 38, see 38 (disambiguation). 38 (thirty-eight) is the natural number following 37 and preceding 39. 38! − 1 yields 7044523022617466601♠523022617466601111760007224100074291199999999, which is the 16th factorial prime. There is no answer to the equation φ(x) = 38, making 38 a nontotient. 38 is the sum of the squares of the first three primes. 37 and 38 are the first pair of consecutive positive integers not divisible by any of their digits. 38 is the largest even number which cannot be written as the sum of two odd composite numbers. 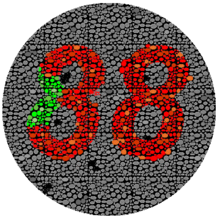 Most people will see the number 38, but people with red-green color blindness might see 88 instead. The 38th parallel north is the pre-Korean War boundary between North Korea and South Korea. The number of games that each team in a sports league with 20 teams that plays a full home-and-away schedule (with each team playing the others one time home and one time away) will play in a season. The most notable leagues that currently have a 38-game season are the top divisions of association football in England and Spain, respectively the Premier League and La Liga. The number of years it took the Israelites to travel from Kadesh Barnea to the Zered valley in Deuteronomy. The "over-38 rule" is a feature of the NBA salary cap that affects contracts of players who turn 38 during their deals. ^ Sloane, N. J. A. (ed.). "Sequence A002982 (Numbers n such that n! - 1 is prime)". The On-Line Encyclopedia of Integer Sequences. OEIS Foundation. Retrieved 2016-05-31. ^ Higgins, Peter (2008). Number Story: From Counting to Cryptography. New York: Copernicus. p. 53. ISBN 978-1-84800-000-1. This page was last edited on 13 April 2019, at 08:20 (UTC).